DISCLAIMER: We have referred 100s of companies to Shopper Approved. Anyone who uses our partner link gets 60 Day FREE trial, not the 30-day free trial. AND you pay $79/mo, not $99/mo. We put our own clients on Shopper Approved because it helps generate sales! 1) What kinds of companies are Shopper Approved for? 4) Why Is Shopper Approved so much cheaper than the competitors? Think about this! When you’re buying something on Amazon or eBay, do you read the reviews before making a purchase? It’s the same thing for your ecommerce or service-based business. This is not just about a Shopper Approved review, it’s a post about how you can use Shopper Approved for other things besides Adwords star ratings. Overall we give Shopper Approved a great 5-star rating. They are the cheapest priced 3rd party review company that will syndicate your reviews to Google Adwords and Bing Ads. Most likely you are just like our clients. You only care about getting star ratings on your paid search ads to beat your competitors. Here are some AWESOME things we came across using Shopper Approved reviews. Increases CTR (click-through-rate) on Adwords, Bing Ads, and Yahoo. This is great especially when your competitors don’t use star ratings. Increases Credibility. There is nothing better than showing a prospective customer your 3rd party reviews. Put the Shopper Approved badge on your site and make a point of saying, “These are 3rd party reviews. We cannot control them.” Use this as leverage that you are a real company that takes care of its customers. For a client, we use Shopper Approved and BBB (Better Business Bureau) to show credibility. We found break downs in communication. One of the best things I like about asking for feedback is our clients’ customers tell us their problems. Many of them tell us before they leave a bad review! A break down in communication is normally the problem, but if you’re not getting reviews, then your customers will not be able to help you out. Even a bad customer experience can help out your company by uncovering break downs in communication. Isn’t the $79/mo subscription alone worth getting feedback from your customers? Refer a few people and you don’t have to pay! You’ll need to be an affiliate so you get credit for this. Great for getting a jump start on reviews. Competitors charge for this feature. 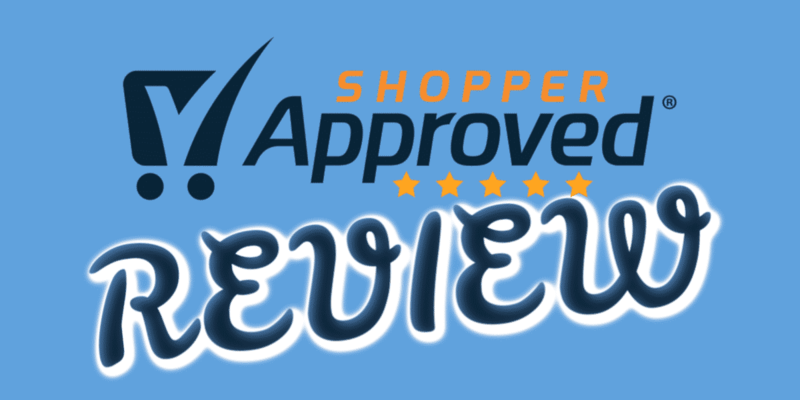 Shopper Approved allows you to email your past customers for a review. To keep this post true to the topic, here’s what I don’t like about Shopper Approved. Fighting negative feedback is hard. Sometimes a 1-star review is so absurd, it seems like a fake review and you can’t fight it. They do have some measures to prevent this, but if a pissed off customer leaves a negative review, it’s there forever. You can respond to the negative review though, but sometimes the customer won’t reply and the review stays there. I understand the logic behind it, but sometimes it seems too buyer friendly like Paypal or eBay. As of March 6, 2019, Shopper Approved has ZERO outside funding. Yes, they care about profits like any other company, but they aren’t like their competitors who receive outside funding. For instance, Yotpo has $101 million (it’s right on their About page) in outside funding and 300 employees. TrustPilot has $55 million in outside funding and 700 employees. These companies MUST charge a higher price for the same outcome that Shopper Approved gives. In the end, it’s about showing star ratings in Google Ads and converting more visitors into sales. Who do you think is going to pay back TrustPilot and Yotpo’s investors? Yup, the subscriber! WE HAVE 300+ COMPANIES ON SHOPPER APPROVED. Here is the overall picture of reviews. A 4.7 rating is good. Don’t worry, nobody has a 5.0-star rating. Once in a while, you’ll have a pissed off customer. This is the area where you can dispute the review. Our client ALWAYS gets negative reviews, but it lets them know that the employees are slacking off and not maintaining communication or not shipping on time. Display your seal in your footer, header or body to build credibility. You can add additional questions to your survey. Here’s something else I really like about Shopper Approved. It doesn’t seem like they are a money hungry company like the competitors. They even helped to open a school in Africa. If you use our Shopper Approved partner link, Planet Marketing will donate to charities using your money. Shopper Approved get the job done. It doesn’t have all kinds of bells and whistles like the competition. If you need something low-cost and that syndicates your reviews into Google Ads and/or Google Shopping, Shopper Approved is most likely for you. It’s mainly for small to mid-sized companies. They have very large companies too like NameCheap (OMG 1.2 million reviews! ), 1800Flowers, and BHPhotoVideo. If you have any questions, comments, or concerns, just ask in the comments below.